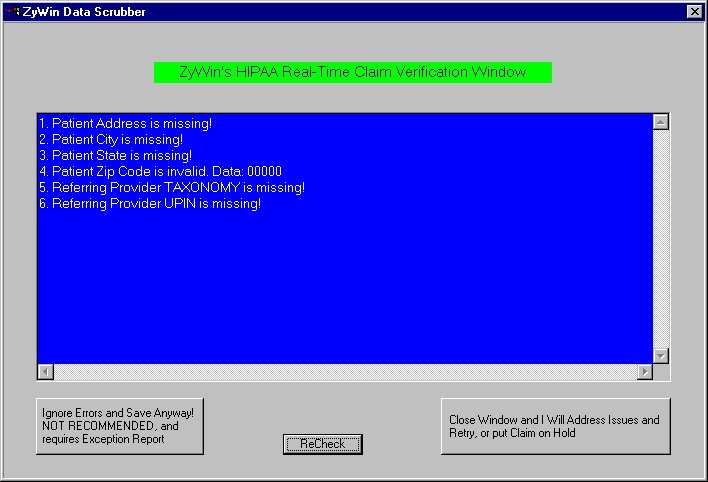 The ZyWin® Scrubber applies the latest HIPAA electronic filing rules to your data when saving a claim. It "scrubs" the data clean, hence the name. Under the ANSI 4010.A1 (HIPAA) filing system, missing or bad data will cause not only the bad claim to reject, but ALL claims residing in the same batch as the bad claim will also fail and not be admitted into the processing system. Therefore, now more than ever in the past, it is imperitive to make sure common data is correct in order that claims are easily admitted the first time for adjudication. When triggered, ZyWin pops up a window alerting the user of the shortfall and will display a recommended remediation if not obvious. Most problems are simple and usually just involve missing information, such as an address line, invalid ZIP code, UPIN, etc. Catching these problems at data entry time makes them easier and much more efficient to resolve since the data entry person usually has the necessary information in front of them. If done in a real-time checkout environment, the User can ask the patient to ensure information is correct. In systems that do not have the ZyWin® Scrubber, the EDI administrator would be saddled with hunting down the correct information and doing the remediation. However, that would be after the entire batch would be rejected costing the practice valuable time and suspending cash flow until the issue can be resolved. ZyWin® Scrubber eliminates these problems. Below is a sample actual screen shot of the ZyWin Scrubber window. This is just a small sample of some of the available messages that could be displayed.